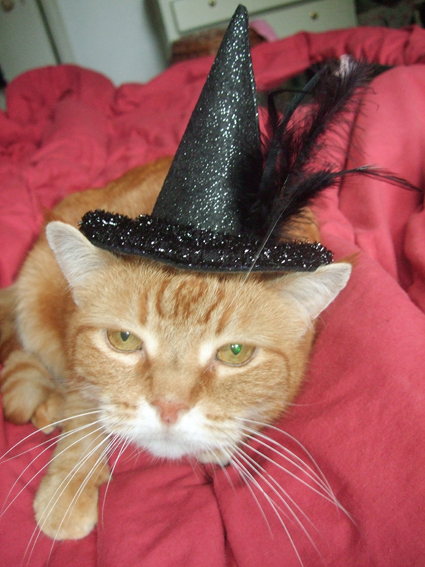 For Hallowe'en here's a picture of my cat wearing a mini witch's hat. I must admit, he didn't wear it for very long - a moment after I took this photo the cat and the hat were parting company fast. My lovely hubby bought me the little hat to wear to Witchfest in November, along with similar hats for the other lovely witches in my coven. The hats are really Hallowe'en hair ornaments that attach with a small clip, and very cute in my opinion. I don't think my cat held quite the same opinion as me though. I've also just noticed that my photo of my cat is up on Stuff on my Cat. I sent it to them ages ago. Maybe they saved it for Hallowe'en like I did.